Ten YouTube Videos I Can't Not Watch: Number 5-Pomplamoose, "Another Day"
We have ten or twenty years of these types of bands ahead of us, and that's fine with me. 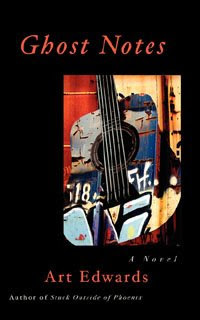 Art's Rock and Roll Writing Course Re-Ups for Winter 2011! Plus X-Mas Deals on Ghost Notes/Songs from Memory! I'm finishing up the first semester of my rock and roll writing course at the Basement Writing Workshop, and I can't tell you how much fun it's been. What great projects my students have, and they're all getting better because they took this course. It's great to be part of the rock lit revolution as it's happening. "What rock lit revolution?" you ask. Keith Richards's memoir Life just came out, for which Richards (and his co-writer) received a seven million dollar advance. The last year has seen rock lit titles by renowned writers like Nick Hornby, Jennifer Egan and Steve Almond, and each has sold well. Even Jonathan Franzen's 2010 mega-blockbuster Freedom features a major character who is a rock musician. And Patti Smith just won the National Friggin' Book Award for her Memoir Just Kids. Sound like something you'd like to be a part of? Well, you can't just show up with your axe and expect to play Madison Square Garden. You have to work on your craft, as all of these writers (or co-writers) did. Here's how to start. Sign up for the Winter session of my online rock and roll writing course. For my class, you can write fiction or non-fiction; as long as it's rock lit, you will have a place at the table. The class is ten weeks long, and you'll get your rock-tinged work critiqued by me and the others in the class, helping you make it the best it can be. And this all happens online, so you can take the class from the comfort of your home. Sound good? Sign up for the Winter 2011 term and get a discount! And here's the best news. My ridiculous deal from last Christmas is back! 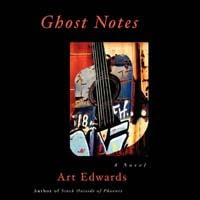 You can buy a copy of Ghost Notes, or its companion piece, my solo CD Songs from Memory, from my web site for just $5! Nowhere on the web will you find these items cheaper. Every copy of Ghost Notes comes signed by the author (he's an ornery cuss, but I can sweet talk him), and all orders of $20 or over ship for free! Would you like to get out cheap with four friends or family members this holiday season? This is the way to do it, and they'll all praise you for turning them on to such a great, rockin', outside-the-box read. Come on over to my store and save big (this book is $15 at Amazon). I must have lost my frickin' mind to make this offer last year, and I'm certifiably insane to repeat it this year. Come take advantage of my cerebral malaise. There's big news ahead in my neck o' the woods for 2011. It will include shopping my third novel, which is tentatively titled Good Night to the Rock and Roll Era; writing the screenplay for Stuck Outside of Phoenix; and starting a memoir project (see, if you make it all the way to the bottom of my posts you get rewarded). Much more on each of these in 2011. Ten YouTube Videos I Can't Not Watch: Number 6-Pavement "Gold Soundz"
Why in the name of Jesus, Mary and Joseph did my band not make videos like this? Will these stupid heavy metal gestures have a hold on me my whole life? God, I hope so.